1. First thing to keep in mind—your dog, new or old, is going to be tempted to chase your cat, especially if she flees from him. Provide her with ample places to hide (preferably off the floor), and restrain your dog. Allowing him to pursue her could mean their getting off to a bumpy start or, worse, result in injury. 2. The addition of a new pet into your home is an unsettling time for your older pet, so cushion the blow by introducing them to each other in short bursts. Before bringing a new pet into the home, install her litter box or doggy bed to get the older pet used to the inevitable change in scenery. Then let them meet. 3. Baby gates provide a protective buffer between a cat and dog, allowing them to safely observe and grow comfortable around each other. Remember—a step-by-step introduction is key! 4. 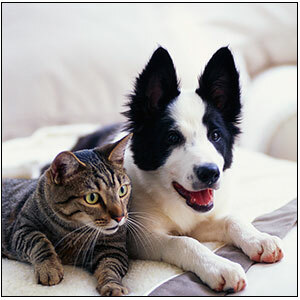 Puppies and kittens can be trained early on to tolerate and respect cats and dogs. Although socialization will typically take longer and more supervision is required—especially in the case of an adult pet meeting a baby one—younger pets typically adapt better. 5. Always look into your shelter dog or cat’s background. If it has had destructive tendencies in the past, it might hurt the other pet. Also, be wary of herding breeds in dogs—their prey instinct is higher, and they’re more likely to give chase. This process requires great patience, as it can take anywhere from a few minutes to several weeks. Whatever the case, don’t get discouraged and fall prey to the old “fighting like cats and dogs” adage. Although they may appear to be natural enemies, cats and dogs can be socialized to tolerate and even enjoy the presence of the other. It’s doing it right the first time that really makes it count.